MOSCOW, Russia -- Authorities are preparing for tens of thousands to march in central Moscow Sunday in memory of opposition leader Boris Nemtsov, who was shot to death late Friday after urging people to protest Russian President Vladimir Putin and the war in Ukraine. 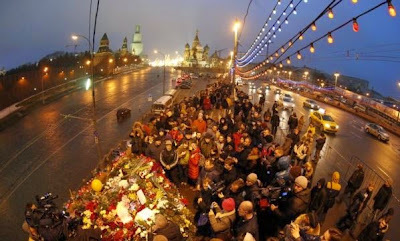 People gather at the site where Boris Nemtsov was recently murdered, with St. Basil's Cathedral and the Kremlin walls seen in the background, in central Moscow, Feb. 28, 2015. The march, which will replace a previously planned opposition rally, was approved almost immediately by city officials Saturday. They've granted a permit for up to 50,000 participants. The officials' press service said "sufficient personnel and material will be used," along with "necessary additional measures of control," the Interfax news agency reported. The event is scheduled to begin at 3 p.m. local time. Putin, meanwhile, has pledged to find and prosecute those responsible for the murder of his prominent critic. "Everything will be done to give the organizers and executors of this base and cynical murder the punishment they deserve," he promised in a note of condolence to Nemtsov's mother, Dina Eidman. The message, which the Russian president's office shared the message with Interfax, also said he sincerely shared Eidman's sorry, and he called Nemtsov's death an irreparable loss. But just a few weeks ago, Nemtsov told the Russian news website Sobesednik that he thought Putin wanted him dead, and he did not hold back his contempt for the Russian leader. Nemtsov was walking across a bridge over the Moscow River with a Ukrainian woman when gunmen drove up and fired from their car window. Nemtsov was shot four times, in the back, within sight of the Kremlin. After police removed Nemtsov's body, mourners began piling bouquets of flowers at the scene. Just hours before he was gunned down, Nemtsov appeared on Russia's Ekho Moskvy radio urging Moscow residents to come out for Sunday's rally. It was to focus on Russia's involvement in Ukraine and the economic crisis at home. Nemtsov's violent death provoked cries of condemnation, as well as tributes to the slain man, from other international figures. Ukrainian President Petro Poroshenko on Saturday decried Nemtsov's murder, calling him a "bridge" between Ukraine and Russia. Poroshenko also said Nemtsov had been preparing a report containing evidence of Russian involvement in the conflict in eastern Ukraine, something the Kremlin repeatedly has denied. The murder was committed to silence him, the president suggested. "Boris declared that he must show convincing proof of Russian troops’ participation in Ukraine," Poroshenko told Interfax, mentioning a recent meeting with the opposition leader. "Someone was afraid of that very much. Boris wasn’t afraid, but his executioners were. They killed him." U.S. President Barack Obama denounced the "brutal" murder and called on Russia to carry out a prompt and impartial investigation. He called Nemtsov "a tireless advocate for his country" and "one of the most eloquent defenders" of the rights of the Russian people. John Tefft, U.S. ambassador to Russia, called Nemtsov a "great patriot of Russia." France's President Francois Hollande also expressed anger at Nemtsov's death. He called the shooting a "hateful murder" and described Nemtsov as a "defender of democracy." Russian Prime Minister Dmitry Medvedev, like Putin, sent condolences to the victim's family. "Boris Nemtsov was one of the most talented politicians of the period of democratic reforms in our country," Medvedev said in remarks posted on a government website. "To his last day, he remained a vivid personality and a man of principle. His actions were open and consistent, and he never reneged on his views." A Putin spokesman said the murder bore the hallmarks of a contract killing and described it as a "provocation." The Kremlin will oversee the investigation, he said. Russia's Investigative Committee is exploring several lines of inquiry, a spokesman, Vladimir Markin, said Saturday. The crime could be an attempt to destabilize the political situation or it also could be linked with Islamic extremism or the situation in Ukraine, he said. “First of all, of course, it is the possibility that the murder could be a provocation to destabilize the political situation in Russia,” Markin said. Nemtsov was a deputy prime minister in the 1990s and many Russian observers predicted he would succeed then-President Boris Yeltsin. But Yeltsin instead chose Putin as his successor. After Putin's subsequent election in 2000, Nemtsov became one of Russia's sharpest and most outspoken critics of the leader, especially since last year's uprising in Ukraine. He said Putin fears that what happened in Ukraine could happen in Russia and sees a pro-European Ukraine as a threat to his own power. In an op-ed titled “Why does Putin wage war with Ukraine?” published in the Kyiv Post in September, Nemtsov blasted the Russian president. "Moreover, Ukraine chose the European way, which implies the rule of law, democracy and change of power," he wrote. "Ukraine's success on this way is a direct threat to Putin's power because he chose the opposite course — a lifetime in power, filled with arbitrariness and corruption." In his comments Friday on Ekho Moskvy radio, Nemtsov reiterated his aversion to Putin’s stance on Ukraine, calling it "a mad, aggressive and deadly policy." "The country needs political reform," Nemtsov said. "When power is concentrated in the hands of one person and this person rules forever, this will lead to an absolute catastrophe."